Caprock is a flat, impervious limestone layer (caliche) that is resistant to erosion and is largely responsible for the distinctive geography and appearance of the High Plains of west Texas and east New Mexico. Otherwise known as the Llano Estacado, this arid, treeless plateau ranges from 5,000 to 3,000 feet in elevation and apart from many shallow, branched drainages is almost completely flat. It is emptiest in the west, in New Mexico, where the land, if used at all, is contained within huge cattle ranches; in Texas the plateau is more developed, for agriculture and oil drilling. The eastern edge of this vast region is marked by the caprock escarpment, where the plateau breaks up into cliffs and badlands, east of which the land is up to 1,000 feet lower and more undulating - known as the Rolling Plains. This escarpment stretches for over 400 miles, from the northeast corner of the Texas Panhandle, near Higgins on the Oklahoma border, south all the way to Big Spring on I-20, and the most spectacular section - with the steepest cliffs and the narrowest transition from high to low - is southeast of Amarillo, and best viewed in Palo Duro Canyon State Park and the smaller, less busy but more evocative Caprock Canyons State Park. 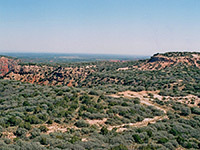 Caprock Canyons State Park is situated in a rural part of Texas, not near any large towns. The nearest settlements are Silverton, Quitaque and Turkey, all rather sleepy farming villages on highway 86 in Briscoe Country, 80 miles southeast of Amarillo. From Quitaque, farm road 1065 leads three miles north to the park entrance and a small visitor center. Admission (2019) is $4 per person, while camping is available from $10 to $22 depending on the level of comfort. From the entrance, a 3 mile paved road crosses scenic badlands and ends at the base of the caprock escarpment, passing various trailheads and other points of interest. First turn off is to a bison viewing area - Caprock Canyons is the home of the official Texas state bison herd, established here in 1997, though currently suffering from a lack of genetic diversity. 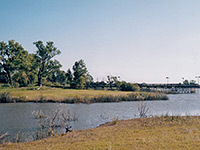 Next the road passes 120 acre Lake Theo, a nice, clean location with good facilities - plenty of parking, benches, sun shelters etc - and popular for picnics, paddling, swimming, boating and fishing. The road beyond passes the main camping area (35-site Honey Flat) and becomes narrower and more winding, with two slopes at 16% grade, as it traverses steep terrain either side of the Little Red River. The road ends at the South Prong tent camping area, start point for one of the main trails in the park (the Upper Canyon Trail). All around are the high red cliffs characteristic of the escarpment, made of sandstones and shales from the Ogallala Formation, and crossed by bands of white gypsum. Canyon Rim Trail; starting from the Honey Flat campsite and ending at the Wild Horse campsite, this relatively easy 6 mile path follows the rims of several small canyons and encounters badlands, washes and low hills as it crosses the grassy land towards the east of the park, beneath the main escarpment. Eagle Point Trail; a 2 mile path over the badlands between the park road near Lake Theo, and the road shortly before the crossing of the Little Red River. The path is also used by horses and cycles. Haynes Ridge Overlook Trail; this climbs rather steeply up the cliffs then heads along a grassy ridge, offering excellent views in all directions. At the end it intersects the Upper Canyon Trail. See full trail description. Lower Canyon Trail; a 7 mile circular route that follows the shallow canyons of the lower and upper forks of the Little Red River, starting either at the penultimate spur road along the park scenic drive (north side) or at the Wild Horse camping area. Mesa Trail; a short loop branching off the Canyon Rim Trail which climbs to the top of a low mesa then circles around its edge. Upper Canyon Trail; the best and (in parts) the most strenuous trail in the park, this 6.3 mile route follows a canyon, climbs steeply up to a high ridge, then returns via another canyon. See full trail description. The Caprock Canyons Trailway is a 64.25 mile hiking/cycling/horse riding route, officially part of the state park, formed by conversion of a disused section of a branch line of the Fort Worth and Denver railroad. It runs between South Plains and Estelline, passing just north of Quitaque, and has access points every 5 to 10 miles, but this is a wide, flat trail across mostly flat land so not all is particularly exciting. 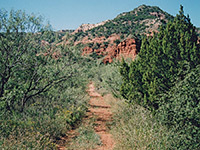 The best sections are through the caprock escarpment via Quitaque Creek (including the 742 foot Clarity Tunnel), and east of Tampico, where the trailway crosses an area of canyons and mesas. The nearest places with hotels close to the Caprock Canyons are Childress (63 miles), Clarendon (63 miles) and Plainview (45 miles).